Water vapor is the most abundant greenhouse gas on the planet, yet it is the least accurately measured globally. In order to make useful climate models, robust measurements of the amount of water vapor in the atmosphere are needed. Junhong Wang, a scientist at the National Center for Atmospheric Research, has been using the propagation of GPS signals through the atmosphere as a way to measure atmospheric water vapor. Other methods include radiosonde (attached to weather balloons and launched twice per day) and satellite observations. GPS has supplemented these methods with its high temporal resolution (up to every 5 minutes), accuracy, and automation. GPS arrays like UNAVCO’s Plate Boundary Observatory and others throughout the world provide a pre-existing infrastructure that is already collecting data that contain water vapor information. 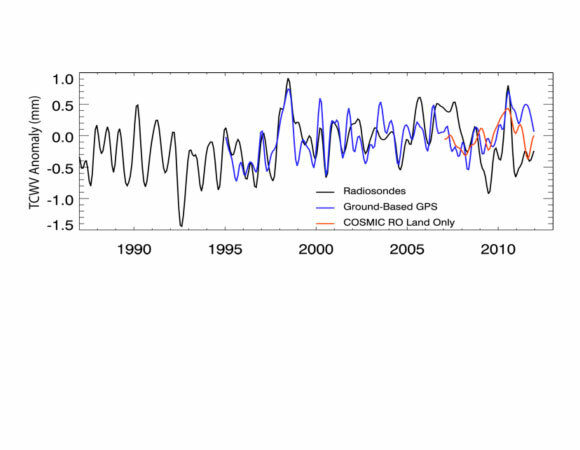 Another benefit of using GPS is that although most station records do not extend as far back as radiosonde, the GPS results provide an independent validation of radiosonde data, allowing for the correction of biases that may exist in older data. 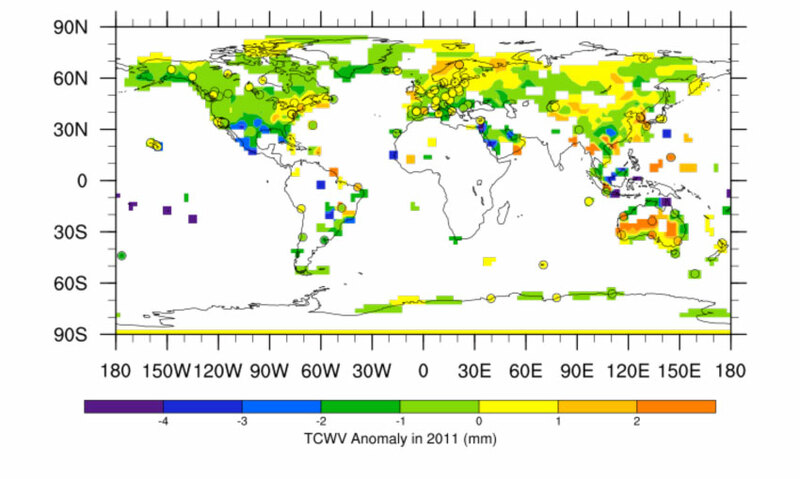 Wang’s results over the past 17 years show moisture increasing over most of the continents, except for South America. 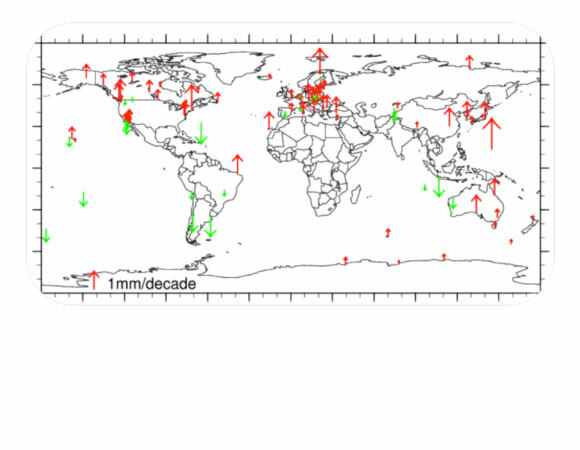 Wang and her colleagues have also created a global precipitable water (atmospheric water vapor) database that provides GPS measurements taken every two hours since 1997. They are currently reanalyzing older databases that were created using methods besides GPS in order to better understand daily, seasonal, and long-term trends in atmospheric water vapor. For future work, Wang plans to continue documenting the long-term trend in atmospheric water vapor as our climate changes. Her results will become more refined and accurate with the spread of real-time GPS throughout the world. Figure 2. 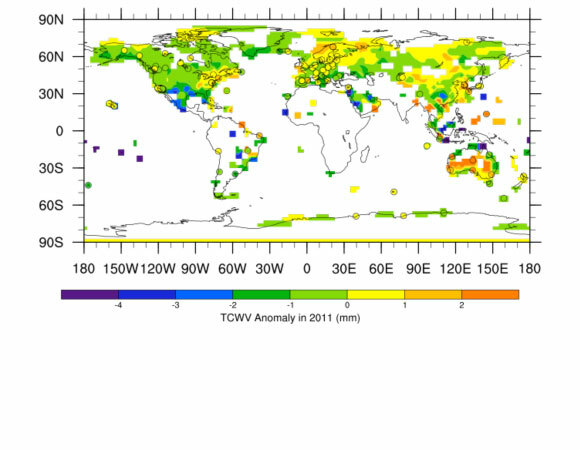 Map of TCWV (total column water vapor, also referred as to PW) anomalies for 2011. The gridded data over land are from radiosondes. The color-coded circles are from ground based GPS measurements. Figure courtesy of Junhong Wang. Figure 4. 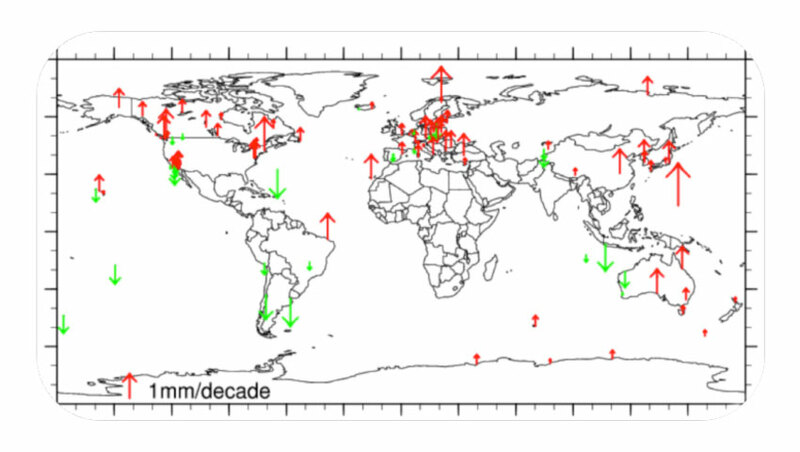 The PW trends from 1995-2011 using the GNSS-PW data at 111 stations. The upward and red arrows represent positive trends, while the downward and green ones are for negative values. Figure courtesy of Junhong Wang. 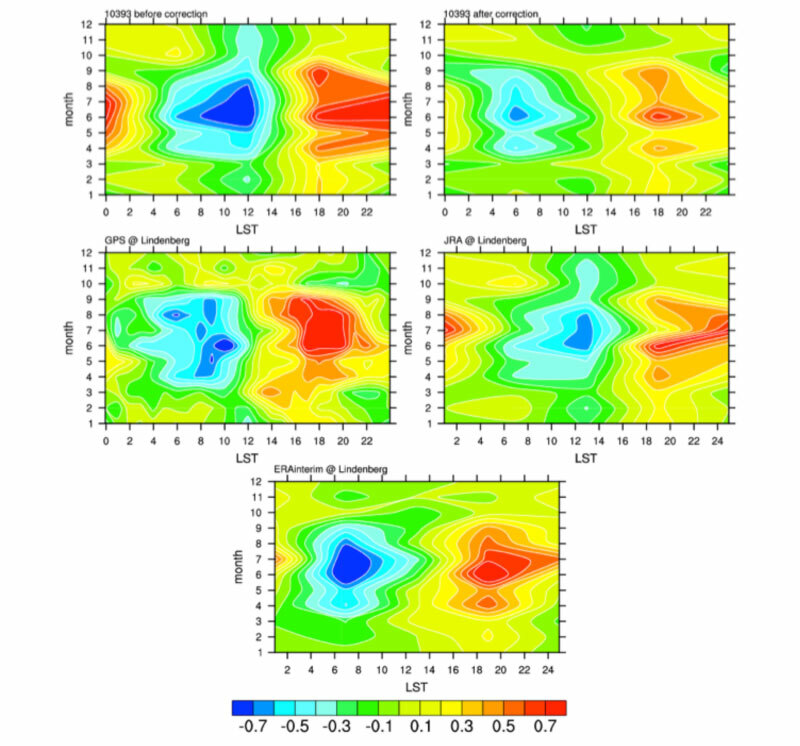 Wang, J., L. Zhang, A. Dai, F. Immler, M. Sommer and H. Voemel, 2012: Radiation dry bias correction of Vaisala RS92 humidity data and its impacts on historical radiosonde data. J. Atmos. Oceanic Technol., to be submitted. 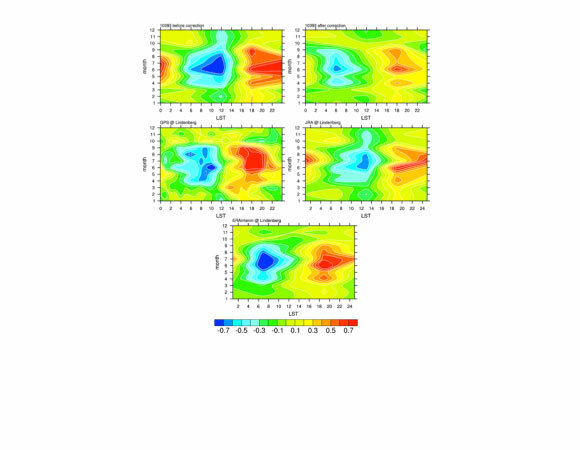 Mears, C., J. Wang, S. Ho, L. Zhang and X. Zhou, 2012: Total column water vapor, in State of the Climate in 2011. Bull. Amer. Meteorol. Soc., in press.